Was It Written by Thomas Paine? Ever since the Revolution there has been a tradition in certain parts of the country that the real author of the Declaration of Independence was Thomas Paine. The storm of opprobrium that beat upon Paine’s name because of his religious writings almost eradicated this tradition. But now that there is a marked tendency to do justice to his unquestioned services to liberty, the legend has revived. It should be said in the outset that with the religious controversy concerning Paine this article has nothing to do. His writing on that subject did not appear till near the end of is life. All the most active years of his manhood were spent in the domain of politics, and the political works of which he was the author are much more numerous and voluminous than those on theology. It is beyond question that he wrought powerfully for the rights of man not only in America, but in France and England; that he risked imprisonment and even life in doing so and that the American sense of justice and fair play can be trusted to give recognition to these services on their own merit. Passing all that by, the inquiry into the authorship of the Declaration of Independence is of sufficient interest to warrant a dispassionate investigation. Reverting to the tradition connecting Paine with that document, it is a significant fact that a newspaper of Newark, N. J., nearly a century ago threatened to divulge the name of the real author of the Declaration and there stated that he was a well known writer and used other terms in describing him that could have referred to no one else than Paine. A further fact of interest is that the friendship between Paine and Jefferson continued unbroken to the end, Jefferson sending a warship to bring Paine to this country. Another fact that may have some bearing on the matter is that Jefferson never claimed to be the author of the document until near the end of his life, which was years after Paine’s death, and even then in slightly ambiguous terms, which are capable of an interpretation that will be brought out later. The evidence on which the claim of Paine’s authorship rests is internal, however, and must be found in the document itself. Several pamphlets and books have been written on the subject in the last thirty years. Prominent among those who had supported the Paine theory may be mentioned William Henry Burr and Van Buren Denslow, students and authors of recognized ability. In the first draft of the Declaration occurred the words, “Scotch and foreign mercenaries.” This offended some members of the Continental Congress of Scotch extraction, and they objected so strongly that the words “Scotch and” were stricken out. Now, Jefferson not only had no antipathy against the Scotch, but was rather prejudiced in their favor, having had two Scotch tutors, so that he could scarcely have written a clause so reflecting on them, but Paine was known to dislike the Scotch, having expressed that dislike in his writings and private conversations. Nor is this the only or even the most conclusive evidence connected with this passage. Jefferson in later years in writing of it showed that he was not sufficiently familiar with this first draft of the Declaration to quote it correctly, for he gave it, “Scotch and other foreign auxiliaries.” Is it probable if he had been the author of it that he would have made the mistake of injecting the word “other” and misquoting “auxiliaries” for “mercenaries?” The very injection of “other” is significant, for Jefferson, having been born in Virginia, would naturally look on the Scotch as foreign and would therefore say “Scotch and other foreign,” etc., but the author of that passage in the original Declaration evidently had another viewpoint, for he said “Scotch and foreign mercenaries,” indicating that he did not think of the Scotch as foreigners. Now, Paine was an Englishman, and whatever his prejudice against the Scotch might have been, a prejudice somewhat common among Englishmen of that day, he would not regard them as foreigners, Scotland and England being united in a common government. Another passage in the original Declaration of Independence censured King George for introducing the slave trade into the colonies, asserting that this traffic, which had been the reproach of “infidel” countries, was thus condoned by “a Christian king.” This passage was likewise expurgated by Congress, as it gave offense to some of the southern members. Now, while Jefferson in later life deplored the existence of slavery, it is hardly possible that at this time he would have injected such language into a state paper. Nor is it likely that he would have made the veiled thrust at Christianity contained in the sarcastic reference to “a Christian king.” That was not Jefferson’s style. But it was Paine’s style. Also the sentiments are his. Already in the Pennsylvania Magazine he had written against slavery. Jefferson, notwithstanding his advanced notions, was not without policy, and there is no policy in this paragraph. But Paine spoke his mind regardless of policy. One of the most surprising things about the Declaration of Independence is that it makes but slight reference to the subject of taxation, despite the fact that the first troubles between the colonists and the mother country had been over the stamp act and “no taxation without representation” had become the American rallying cry. Jefferson had no peculiar bias that would have caused him to make so notable an omission, but Paine had. He regarded the taxation issue as trivial and as being too mercenary to be worthy of so much attention. These sentiments are freely expressed in his writings. Liberty and independence were the great shibboleths with him, and these are always the keynotes sounded in the Declaration. Moreover, the ideas throughout the document are those of Paine. His ideas of government, as embodied in his “Common Sense,” ideas which were then considered peculiar, are found in the Declaration of Independence. His theories as to equality, as to the rights of man and as to the right of rebellion not only in this particular instance, but generally, are all stated in that instrument. Not only so, but the methods of expression are startlingly like those in his published works. The style is not the scholarly, easy and pleasing one of Jefferson, but the terse, epigrammatic, forceful one of Paine. The manner of piling up the indictments against the king, charge upon charge, until they became a very mountain of evidence, is the well known method of Paine, not that of Jefferson. 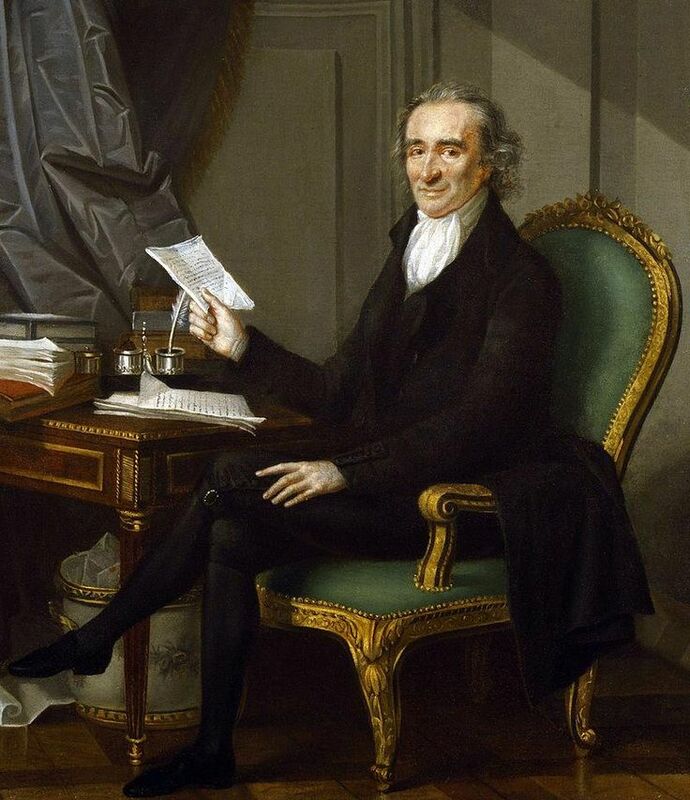 The employment of certain words in peculiar ways, such as “decent,” “equal,” “rights,” “happiness” and many more found in the document, is significant, for these were stock words with Paine, and he used them in just the ways they were used here. The reference to “nature and nature’s God” is in perfect keeping with Paine’s well known deistical notions and startlingly calls to mind his eloquent apostrophe to the revelation of God found in nature. There are three references to the Creator in the Declaration, and they are all very like Paine, who thoroughout his political works is constantly making similar utterances. Jefferson, while a deist also, hardly ever makes a mention of God in his political writings. Most of the above considerations are urged by Denslow and Burr, but there is one little piece of evidence that seemingly has escaped these authors which to the writer seems the most conclusive of all. It is the use of the word, “hath,” which occurs in the preamble of the document. Scholarly Jefferson in all his writing is never known to have employed this archaic verb ending, while Thomas Paine used it frequently and in just such a connection as it is found in here. That may seem a small thing, but it is just such a clew as a detective selects to work out a case. It is like the bone of a prehistoric monster from which the scientist constructs the entire skeleton. The most probable theory of the writing of this most famous of political manifestoes is as follows: After the publication of Common Sense, which had fired the colonies for separation, Paine urged the step in season and out of season. What more natural than that he should have framed a paper that could be adopted by Congress as its reasons for independence? After writing such paper he would naturally read it to some of his cronies. Two of his most familiar friends were Jefferson and Franklin. When these two were appointed on the committee, what more probable than that they should have gone to Paine to get the draft. Using this as a basis, Jefferson could have written the copy presented to Congress. Some words he would doubtless change. Probably he would frame introductory and closing sentences. This theory would be in keeping with Jefferson’s own utterances on the subject. It was years after that he made the first reference to the matter. Then he only said: “The committee for drawing the Declaration of Independence desired me to do it. It was accordingly done, and, being approved by them I reported it to the House on Friday, the 28th of June.” It was not till just before his death that he said, “I wrote it.” In a manual sense that was doubtless true. The opening and closing sentences and certain alterations he may have actually originated, but as to the main body of the document it can be said as it was said of old: “The hand is the hand of Esau, but the voice is the voice of Jacob.” The hand is the hand of Jefferson, but the voice is the voice of Thomas Paine. The fact that Paine never claimed the authorship is in perfect keeping with his character. He was ever a most secretive man. Most of his works at this stage in his career were anonymous. Common Sense was published anonymously, and The Crisis practically so. His contributions to the Pennsylvania Magazine were signed by fictitious names and initials. Many letters he is known to have written and others that are believed to be his he never acknowledged to the time of his death. Moreover, to have made this claim in relation to the Declaration of Independence would have embarrassed his friend, Jefferson, which, both for personal and political reasons, he would have been unwilling to do.